You have big plans for your new portable warehouse. Many use it for their business, she shed, guest house and more. One thing to consider adding to your shed is electricity. Once set up professionally it can increase the possibilities of your space. But, electricity is not something to take lightly, as it can be very dangerous to work with. The key is finding the most cost efficient, safe choice for your use. 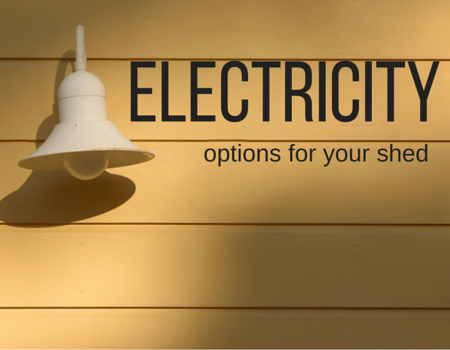 When making this decision, here is what to consider before adding electricity to your shed. Check your local building and electrical codes. There may be restrictions on what you can do. If you want to use it for your business, you must get a professional electrician to install it. Certain permits may be needed from your local government before you can begin your project. We recommend you hire a professional any time you decide to add electricity. Working with any size voltage can be dangerous, and if installed incorrectly could put you and your family at risk. Understand, wrong or damaged wiring could pose a serious threat to your safety. You may think running extension cords is the best option for your small shed. Though it may sound like the easier option, it could be one you regret down the road. Have your electrician add more outlets to your space so you can refrain from relying on extension cords. Choose the right power supply. The key is finding the most cost efficient, safe option for your use. This may mean running electricity from your home to your portable warehouse building. Or you may decide to go with a solar panel option. Solar panels can be a great option if your shed is far away from your home. Understand though, the upfront cost can be substantial. But, if you plan to use your shed frequently, and running electrical lines to it isn’t conducive, this could be the right option for you. No matter your choice, remember to put safety first; let a professional install and then have a qualified person inspect it. Will you have special electrical needs?Consider what you may need before installation. If you are wanting this for your business office, then consider where you will need your phone, internet and regular electrical outlets. If you will be working with specific high powered tools, then inform your electrician of the specific uses, so they can install the safest conduits for your purpose. Plan out your space and see where you will need your electrical outlets. Remember to put safety first and choose the right power source for your needs. With the right set up, your Cook shed will have endless possibilities. 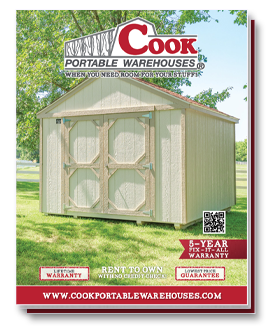 If you're still looking for the right storage shed or workshop, tour our variety of portable building options.